PLAYERS young and old came together at the Seven Oaks in Carlow on Saturday evening to celebrate Mill Celtic’s 30th anniversary. 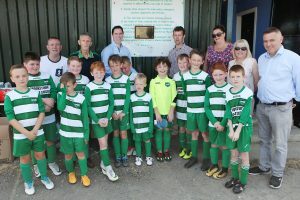 Martin Heydon TD and Cllr Ivan Keatley officially unveil the 30th anniversary commemorative plaque along with members of Mill Celtic FC committee Pascal Timmons, Danny Mackey, Geraldine Corcoran (chairperson), Fionnuala Mackey and Liam Kirwan and Under 10 team. An invitation was sent to every player who represented the club and a huge crowd gathered to share stories of past glories. Over the last 30 years, the club has seen plenty of ups and downs but from humble beginnings, the club has represented the village in fine style and is well placed to continue doing so for many years to come. The club was formed in time for the 1988/89 season and began life in the Carlow League with a committee of Peter Daly (Chairman), Jimmy Mackey (Vice chairman), Sean Timmons (Secretary), Mick Barrett (Treasurer), Eddie O’Shea (Assistant treasurer), Ollie Cullen (PRO). They marked their first season with Division 2 league success in Carlow and that was the start of a trophy laden beginning for the club. They won either a league or cup, sometimes both, in their first four seasons in the league as soccer thrived in the area. The decision was then taken to move the club to the Leinster Junior League in time for the 1992/93 season and that was to spark one of the best periods in the club’s history. League success followed in the next two seasons but the club had perhaps their most famous week late in May 1995. In the space of just over a week they competed in prestigious Sheeran Cup and Counties Cup Finals. First up, the village of Balitore emptied to watch the team take on Broombridge Utd of Cabra in the final of the Sheeran Cup in Tolka Park on 24 May 1995. The team that day was: James Mackey, Noel O’Connor, Paddy Mackey, Tom Cullen, Aidan Dempsey, Noel Mackey, Tom Mackey, Danny Mackey, Mick Barrett, Tony Nolan (Barry Mackey 56), Brendan Hickey (Ronan Mackey 62). Mill put in a good showing but fell to a goal in either half and lost 2-0. They made up for that eight days later though when they took on Charleville Athletic of Tullamore in the Counties Cup final in Portarlington and won 2-1. The constant travelling around Leinster took its toll on the team and they moved to the Kildare League for the first time at the beginning of the 2000/01 season. Again, Mill went quickly about lifting silverware. They picked up the Premier Division Cup in 2001 and then had a fantastic season the following year. Wins in places such as Limerick and Clare brought them to the last 16 of the FAI Junior Cup before losing 1-0 away to Meath side Bellurgan, and the team also made the last 16 of the Leinster Junior Cup. The season culminated with two KDFL cup finals against local rivals Castle Villa in the space of a week. Both games went to penalty shoot outs and it was first blood to Villa when they lifted the Premier Cup but a week later, Mill made amends by lifting the Lumsden Cup after another shoot out. Mill retained the Lumsden Cup the following season by beating Coill Dubh and they finished runners up in the league that season too. The introduction of summer soccer in the KDFL in 2008 hit the club hard and they pulled out of the Kildare league a couple of years later. The club came back strongly when entering Carlow league again in 2013 and the trophies have flowed since as well. A women’s team was formed for the first time for the 2015/16 season and they too got in on the trophy winning habit by lifting the Carlow Division 2 title the following season. As somebody who spent 18 months playing for Mill Celtic during their time in the Kildare League, I can attest to what a truly unique and wonderful club it is. The close knit nature of Balitore means the club has always been at the heart of the community and the support off the pitch and the effort on it have combined to give the village some of its greatest days. It’s not always easy running a club in a small rural village but the club has seen more good days than bad and should be very proud of all they have done over the course of their 30 years. Over the years they have punched way above their weight and there were times that they competed against, and beat, some of the biggest and best clubs in Leinster and beyond. There is no doubt that they will win plenty more trophies and create many more memories in the years to come. Here’s to the next 30 years and many more beyond.